Ever thought about what compels you to follow one company on Twitter but not another, even when they’re offering the same service? Or why you’ll happily hand over your precious email address to subscribe to particular companies’ newsletter? Or even what makes you sign up to a blog? What we connect to, what evokes our emotions and gains our trust and loyalty, is a brand’s tone and voice. We want authentic and engaging, and we can spot fake and disingenuous in a heartbeat. For a company to achieve that authentic communication, they need to know who they are. This is as true for small businesses as it is for larger corporations (although implementing in smaller companies or entrepreneurships can be lot easier!). Do you know how you want your business to come across? It can be a tricky one to figure out and even harder to put into practice consistently. But finding that voice, and sticking to it unfailingly, can help win over a faithful and committed community. First of all it’s important to figure out who your company is. Your brand is not just your logo and website design, it’s what defines the heart and soul of your business. It’s the reason you started (beyond finance) and what you want to bring to the world. It’s what sets you apart. If you’re old school like me, grab a pen and paper, alternatively open up MS Word or login to Evernote and answer the following: (thanks to @buffer for these). This will provide a few helpful adjectives (ideally no less than 3) that can be used to start describing your voice and tone. We didn’t want to be: Authoritative, Imposing, Bossy or Cold. It’s important that these are a genuine reflection of the aims and values of your company. These words will then help provide guidance for how to communicate in your marketing. If you manage to develop a voice that appeals to your customers then they will happily share the love and your community will grow. It’s easy to see bigger companies achieving this and feel overwhelmed or unable to compete (imposter syndrome anyone?). They have the big budgets, the massive marketing teams and industry expertise, how can we compete? But remember you don’t need a huge budget to put out a blog article, newsletter or have a presence on social media. The massive marketing teams are made up of individuals who are just people with ideas like you. And who knows more about your company than you do? Red Bull – adventure, try, adrenaline. 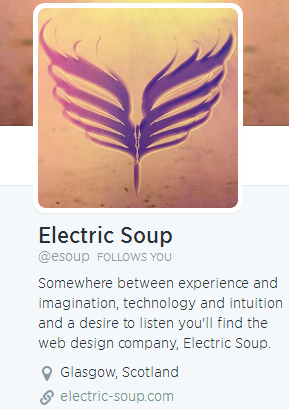 I was fortunate enough to be followed on Twitter recently by a company called Electric Soup. I make a point to set aside time each week to reach out to new followers or people who’ve been generous enough to retweet me. When I looked at electric soup’s twitter bio it immediately made me feel “warm & fuzzy”. This is a company that put in some time and thought, made the most of the space that social media platforms gave them and it worked, I was hooked. Spend some time crafting your bios; how do you feel when you read them, do they sound like, or include, any of your adjectives? Once you’re happy with it (for now at least, remember you can easily tweak later) keep it consistent across all platforms. The adjectives you have from the earlier exercise will definitely help set you on your way to achieving a consistent voice. The next step is to expand on this, laying out how you want your company’s voice and tone to come across. This can cover everything from how you want to sound when emailing clients to communicating on social media to writing your blog posts. Mailchimp have taken this a step further and have a complete, interactive guide where they explain how to speak to customers at different stages, channels, and areas. Let’s start with a simple, one page reference point for the moment! Putting this together will prove useful both in terms of the exercise itself and also as a reference point for in the future (especially when you take on all those extra staff and want to ensure they’re on the same page!). Your brand character (voice) – you’ll have some of these from the above exercise. These adjectives may include things like: inspiring, friendly, intelligent, playful, warm, professional & authoritative. 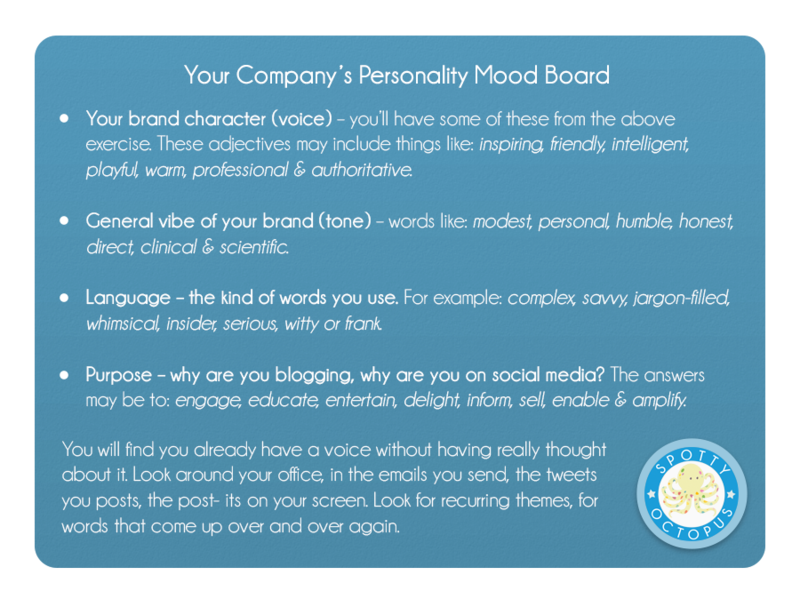 General vibe of your brand (tone) – words like: modest, personal, humble, honest, direct, clinical & scientific. Language – the kind of words you use. For example: complex, savvy, jargon-filled, whimsical, insider, serious, witty or frank. Purpose – why are you blogging, why are you on social media? The answers may be to: engage, educate, entertain, delight, inform, sell, enable & amplify. You will find you already have a voice without having really thought about it. Look around your office, in the emails you send, the tweets you posts, the post- its on your screen. Look for recurring themes, for words that come up over and over again. (Thanks to Stephanie Schwab, writing for Social Media Explorer, for some of these examples). Also ask colleagues and co-workers. I asked the collaborative team what words came to mind when they thought of Spotty Octopus and got a great list that I’d never have come up with on my own. Finally don’t forget to ask clients (Copy Hackers suggests asking new customers directly by emailing new customers with a thanks for choosing us and which of the following adjectives do you feel best describes us). While researching and writing this article I decided to put a voice mood board together for Spotty Octopus. While we had different pieces of the information in various places we’d never collateted it all in one document. If you’d like to see it I’d be more than happy to share it with you, just ping me an email or jump over to twitter and ask. Mailchimp have done great work in sharing their resources, providing guides and a number of videos and articles showing Mailchimp at work. They are transparent in many of their business practices, not trying to hide or hold onto their secrets of success but putting it out there for all to see. I’m grateful to them for this, and they have a loyal customer in me because of it. Perhaps the current King of Transparency is Buffer, a social media management tool. Now there are a lot of these tools around, many with bigger budgets and more flashy marketing. I initially fell for Buffer because it was so simple to use, I didn’t need to read a guide or watch a video. I simply created an account, linked it to Twitter and started scheduling tweets. But what’s made me a “fan”, has me singing their praises, retweeting their tweets, reading their blogs and even writing an article about them, is the ethos of the company. Buffer have such an authentic voice and transparent nature that it doesn’t take long before you feel like you’re part of the family. I have to admit to having a GIANT crush on the company. I’m sure I’m not the only Bufferette (?) out there, but like I said that’s all saved up for another article. Talking about crushes, having you ever thought how growing your business community is like dating? Companies that try to sell to us before even getting to know us are like potential suitors who ask us for our phone number before even asking our name, let alone buying us a drink and engaging in a conversation with us. The ones that take their time, and put in some thought and effort. The ones who make us laugh with their by-lines, tempt us with their bios and entice us with their knowledge / expertise. Those are the companies that we keep going back to, time and time again. Voice and tone humanise your brand, people want to communicate with people not faceless corporations. This is how we form connections and relationships. As with dating we want to connect with people who take an interest and are interesting, not people who just talk relentlessly about how wonderful they are. 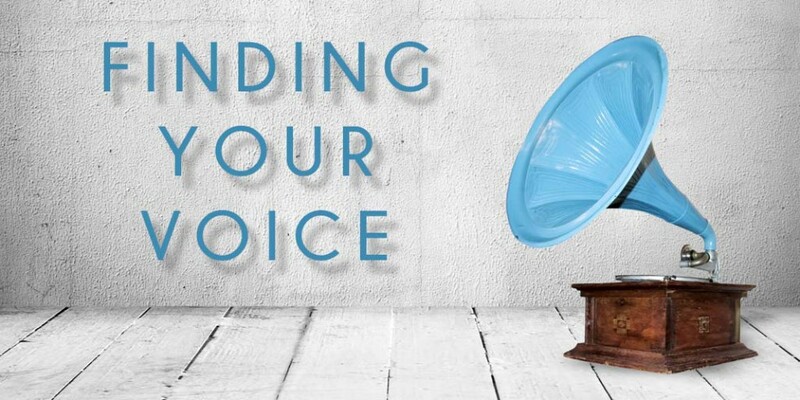 Knowing your company’s voice, and how you want to come across, helps your personality shine through. If you have the same person writing your blog, sending emails, doing your social media and talking to your clients (i.e. you) then your tone and voice is likely to be consistent. However there comes a point when that isn’t feasible anymore. Knowing what you want your tone and voice to be makes it easier to share or outsource aspects of your marketing while maintaining consistency. If you’re struggling with who you want your brand to be, or how you want it to sound, then we’d love to help you figure it out. We’d love to hear the top 3 adjectives for your company’s voice. Please share them with us in the comments, and if you found the article interesting please share using the social buttons below. Great post Lucy! I really like how you talk about humanising your brand – and speaking to your audience in the language, tone and style you know they’ll relate to. And the Dating Principle – absolutely. It’s easy to pick out the ones that just want to sell you something right away. Blunt Brit’s Top 3 Adjectives: Humorous, Down to Earth, Helpful/Educational. Thanks for the fab feedback Nolan, great to hear you enjoyed the post. Love your adjectives, they’re a great representation of your brand! Great article. Bufferette is a brilliant new word. Must check out the world of bufferism. Thanks for the insights! You’re welcome Simon, glad you enjoyed the post. I’m sure you’ll be a Bufferette is no time! Great to hear you found it helpful Anne, and thanks so much for sharing.